Clare Shine has made the move from Cork City back to Glasgow City. IRELAND STRIKER CLARE Shine is making the move back across the water after re-signing for Glasgow City FC. The 23-year-old has spent the last two seasons on home soil with Cork City, but prior to that had an 18-month spell with the Scottish outfit, scoring 36 goals across 2015 and 2016. Shine enjoyed many successes with the club and made a massive impact from the get-go after signing in May 2015, most notably scoring a hat-trick in that year’s Scottish Women’s Cup final as Glasgow won 3-0. Before making the initial switch to Scotland, she played for Raheny United in the debut season of the Women’s National League (WNL). In 2013, the Cork native starred as the Pandas won the league and cup double, before competing in the Champions League where she scored four goals. On the international front, Shine powered through the underage ranks and made her senior debut in November 2015 under Sue Ronan. She’s been in squads under Colin Bell for the Cyprus Cup and international friendlies, but is yet to appear. 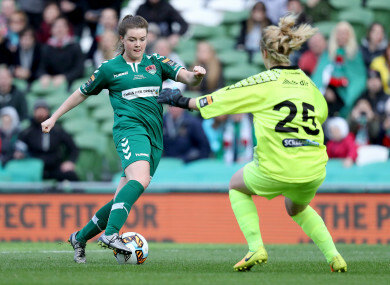 One of the most exciting attacking talents in the country and also a gifted camogie player, Shine’s past few years have been hampered by injury but she had a memorable day with Cork City in the Aviva Stadium in November 2017. She bagged the only goal of the game as the Leesiders beat UCD Waves to the FAI Women’s Cup crown. Shine will hope to put those injury woes behind her now as she begins a fresh start, and opens her second chapter in Glasgow. “Glasgow City FC is delighted to welcome Clare Shine back for her second period with the club,” head coach Scott Booth added. “She is an attacking player who knows how to find the net as well as providing fantastic link up play for her team-mates. Glasgow City won their 12th Scottish league title in-a-row last October, and have just opened their bid for 13 in the top tier. Email “Cork striker makes the move back to Scotland after stint on home soil”. Feedback on “Cork striker makes the move back to Scotland after stint on home soil”.